A discharged vehicle battery may already freeze at temperatures just below 0 °C. If the battery is frozen, do not jump start with the battery of another vehicle – there is a risk of explosion. 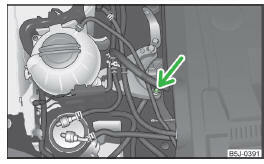 Pay attention to the warning instructions relating to working in the engine compartment » page 139. The non-insulated parts of the terminal clamps must never touch each other – there is a risk of short circuit. The jump-start cable connected to the positive terminal of the battery must not come into contact with electrically conducting parts of the vehicle – there is a risk of short circuit. Do not clamp the jump-start cable to the negative terminal of the discharged battery. There is the risk of detonating gas seeping out the battery being ignited by the strong spark which results from the engine being started. Route the jump-start cables so that they cannot be caught by any rotating parts in the engine compartment. Do not bend over the battery – there is a risk of caustic burns. The vent screws of the battery cells must be tightened firmly. Keep any sources of ignition (naked flame, smouldering cigarettes, etc.) away from the battery – risk of explosion! Never jump-start vehicle batteries with an electrolyte level that is too low – risk of explosion and caustic burns. There must not be any contact between the two vehicles otherwise current may flow as soon as the negative terminals are connected. The discharged battery must be properly connected to the system of the vehicle. We recommend you buy jump-start cables from a car battery specialist. The battery of another vehicle can be used to jump-start your vehicle if the engine will not start because the battery is flat. Jump-start cables are required for this purpose. 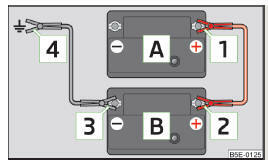 The jump-start cables must be attached in the following sequence. Attach clamp 1 to the positive terminal of the discharged battery A » Fig. 146. Attach clamp 2 to the positive terminal of the battery supplying power B . Attach clamp 3 to the negative terminal of the battery supplying power B . Attach the clamp 4 to a solid metal component firmly connected to the engine block or to the engine block itself. Start the engine on the vehicle providing the power and allow it to idle. Start the engine of the vehicle with the discharged battery. Disconnect the cables in exactly the reverse order to the one described above. Both batteries must have a rated voltage of 12 V. The capacity (Ah) of the battery supplying the power must not be significantly less than the capacity of the discharged battery in your vehicle. Only use jump-start cables which have an adequately large cross-section and insulated terminal clamps. Obey the instructions of the jump start cable manufacturer. Positive cable - colour coding in the majority of cases is red. On vehicles with the START-STOP system, the jump-start cable of the charger must never be connected directly to the negative pole of the vehicle battery, but only to the engine earth » Fig. 147.